The small size of this Psalter suggests that it was intended to be carried about by the owner, rather than kept on a shelf or reading-desk. It has a medieval ownership inscription which shows that one (or two?) of its earliest owners were nuns of Holy Cross Monastery, Wherwell, a few miles south-east of Andover. This page has the end of the Creed, and the facing page has the start of the litany of saints. 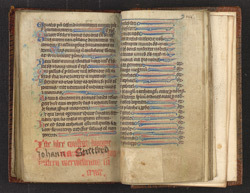 In the lower margin is an ownership inscription in red, which the original has been erased and rewritten in black. It now reads: 'This book belongs to Lady Johanna Stretford, of Holy Cross Monastery, Wherwell'.